"I wonder if you come in need of Tu'whacca's peace or have come to wield Leki's rage? The wind of the dunes tells me that you desire one or the other, there is no place in-between." Primary Motivator - Strength: "The constant improvement of one's self and the burdens one bears against great odds! That is true strength! That is what I will become: an unending storm that will torment any who dare misstep in Leki's lands." Secondary Motivator- Balance: "Physical ability and martial knowledge must be mastered alongside other skills or else the storm will not last. Faith in oneself and a trust in one's abilities will allow one to walk a balanced path that even the most gilded jewel could not provide." Emotional Disposition - Calloused: "The demands of Ra Kotu have hardened me, the office of the Huntmaster has taught me. I cannot isolate myself from others, I cannot find my balance or embrace my strength without them. I do know now though, that all who walk these sands will die. Through age or through battle, they will sit upon the Far Shore in time. I wear my armor close to my heart and I pray for the safety of my allies, but I am prepared for when the time comes so I do not hesitate and cost anymore lives. " Sense of Humor - Specific: "Was it rude to laugh when that man fell off his horse? Perhaps. It was even funnier when he had broken his ankle." Usual Mood - Calm: "Nothing here is worth being emotional over, there are larger beasts to hunt." Outlook - Pragmatist: "The world is not a holy place, nor will it ever be one if no one does anything. I might fight against the winds, but if I can shift one grain of sand that will be enough. Compromises must sometimes be made, but it must be done for the greater good." Integrity/Morals - He Who Fights Monsters: "I have hung monsters from the walls of the fortresses that they thought would keep them safe. I have burned down the gates of violent zealots and cast them to their gods with shattered bodies and pained screams. I have crawled through the ashes of my own madness to see that I walk a narrow path between zealotry and righteousness. I will bring peace to the Alik'r, I will bring safety to my people; but I cannot sacrifice their values to do so." Impulsiveness - Patient: "I am unyielding and patient but I am not a pacifist; my mercy is not boundless and my patience can be worn away." Boldness - Daring: "Who dares, lives." Flexibility - Torn Traditionalist: "Some things must never change, others are meant to be changed. Which is which through is often hard to decide." Conformity - Unconventional: "I am the son of a whore and a proud warrior: my father was the whore and my mother the rider. 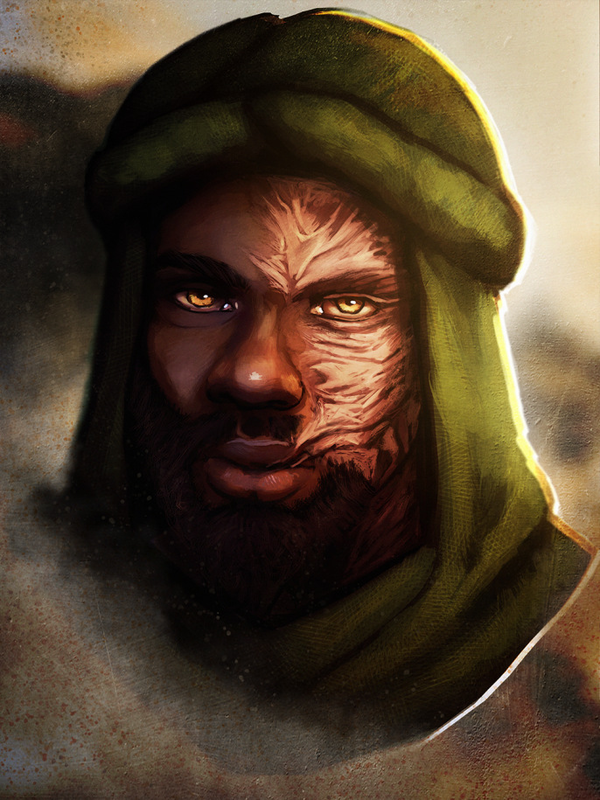 My upbringing was not entirely conventional in of itself, but they raised me as a Redguard should be nevertheless." Openness/Sexual Expression - Open-minded: "Physical pleasures are rare treats and must be enjoyed while they can be, but it is important not to become lost in them." Religious Affiliation/Worship: Yokudan Pantheon and Son of Leki: "The Gods, from Ragupta to Leki must be honored. Their breaths give us life and they guide us through it; loyalty to them is rewarded in this life and the next." Expression of Beliefs - Conservative: "I will not force the Gods on anyone, that is their choice. I will not allow undead, monsters, and filth from tainting Hammerfell. Those that live in the shadows are not welcome in Leki's blessed land!" Distaste for Eastern Magic: "I fell into Akel's hunger, felt the nothingness between worlds and realized my own connection to the Alik'r. In that darkness, I felt the pain of not knowing Tava's winds and the blessing of Zhet in the sands around me, I understand now my own abilities; but I cannot understand the arcane of other lands. The other schools are not for many hands, I cannot grasp nor do I try to grasp them." Akel's Horrors: "Nothing. Absolute nothing. No sound, no voice, no breath. Perhaps even no death? I lingered in Akel's hunger for only a few minutes, but there was no time. I grew mad from the feeling of my own heart beating in my chest, I prayed for it to stop but even then I could not hear the words in my head. What I have seen in this darkness? It will never leave me, I will never escaped it: it is what lies between the stars and what Ruptga has saved us from." Blunt: "I see no reason to lie nor for tact, the truth is better than any polite lie." Fanatical Hatred of the Undead: "Cow's blood today? Pig's blood tomorrow? Maybe in a week they're back to killing us to survive: it cannot stand." 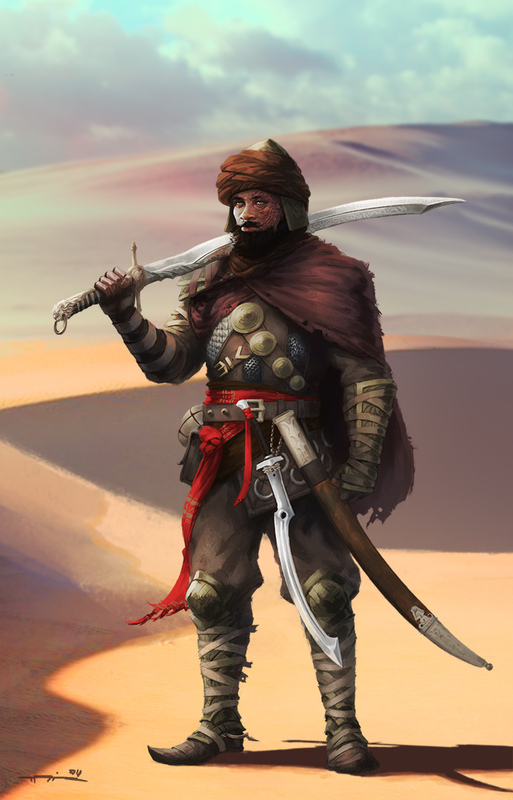 Desert Warrior: "Heavy armor and two-handed weapons are cumbersome and sink you into the sand. I've shunned the art of these tools and I refuse to devote valuable time to a craft that is ultimately wasted on me." Extensive Burns: "I have seen the evil that magic can do, and I have felt it tear away at my skin." Damage from Desert's Rage: "A mixture of aloe...duneripper shell...and a number of other holy mixtures has taken my voice from me. There are nights that I cannot sleep and I am tempted with the numbness that the 'Rage' grants me. I hunger for it, it calls to me. I worry what else it might take." Speaker for the Dead: "For my crimes, I have been burdened with their names. Every soul that is extinguished in the war against the Marquis, I wrote the names to their families. Hundreds of letters, body after body. I am among the living when my time is consumed by the dead. The battles weigh on them, the war weighs on me." Broken Obstinacy: "In a time of great chaos I acted upon my beliefs, I slew a great demon against the wishes of the House. She thanked me for relieving her of the curse, but in the process, I now pay for that blessing. I have been uprooted and I am unsure how to lay my roots when I regain my balance." Demands for Foreigners: "Foreigners and outsiders. During the War of the Lions, few outside a select and righteous group were willing to shed blood for the Alik'r. Token gifts of horses and the occasional crate of supplies might warm the hearts of those within the cities, but from the view of the front, it was all petty. There are good souls, who are not born of Yokuda, who are Redguard at heart. Those who wish to dwell in Ra Kotu though will have to meet the standards of these 'righteous among outsiders' to earn my trust." The Lion's Death: "When the War of the Lions ended and the Marquis was laid to waste, I sacrificed a figure that united my people for the sake of ensuring Najib suffered a terrible insult. The history and truth of the Lion is known to only a select few, so I bite my tongue and let the sacrifices of my people fade. 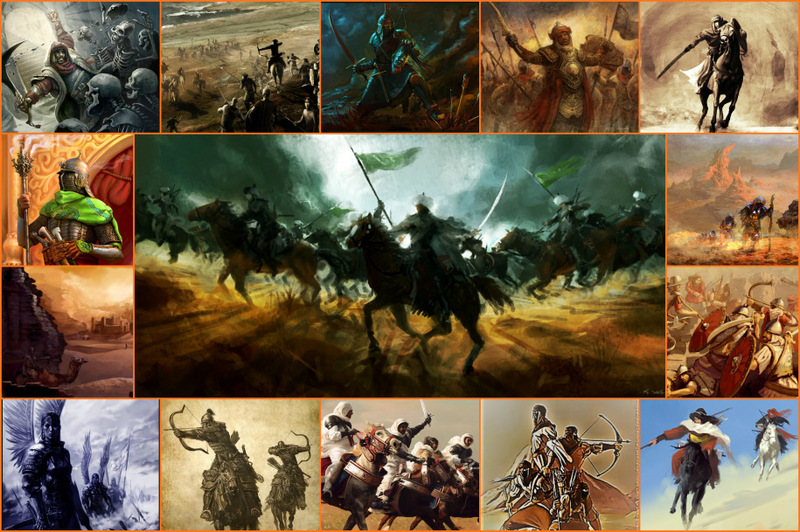 The war will always be won by the great armies, never the forgotten warbands." 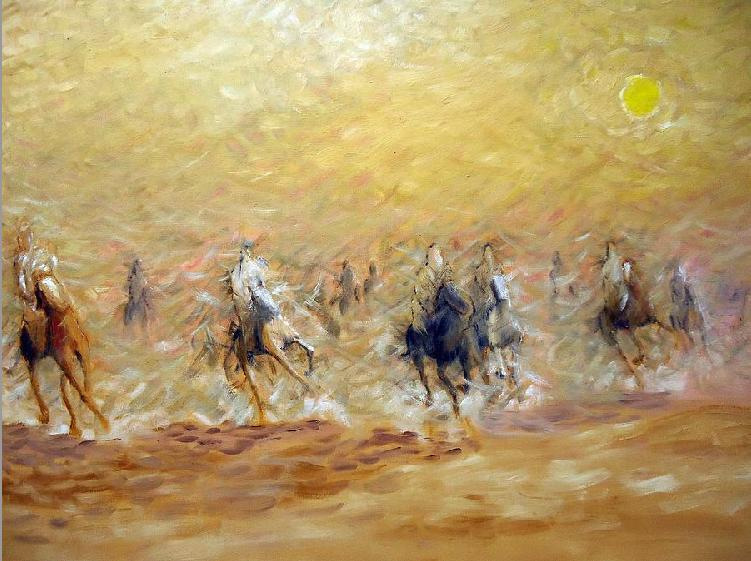 Desert Warrior: "I was born in the saddle and lived among the tribes of the Alki'r desert. I've spilled blood in tribal conflicts and chased beasts across miles of wasteland. I am one with the desert and at peace with the abilities it demands." Ash'Abah Off-Shoots: "My mother taught me the ways of our tribe since I was a child and the shamans have guided me well along the path of righteousness. The Children of Leki are born to hunt and purge the undead from any land regardless of its cost." Survivor of Sentinel: "I have felt the fires rip the flesh from my skin and toss me half way to the Far-Shore! I have been broken, I have been torn to shreds! I will not be broken! I will break the chains of my enemy and flay the flesh from their heretical bones!" Slayer of Demons: "I have cut down Daedric hordes alongside my brothers! Together we rid the sands of the nightmarish ancient vampire Naiha! My nights are haunted by what I've faced, but we have learned. We are stronger for the battles we've survived." 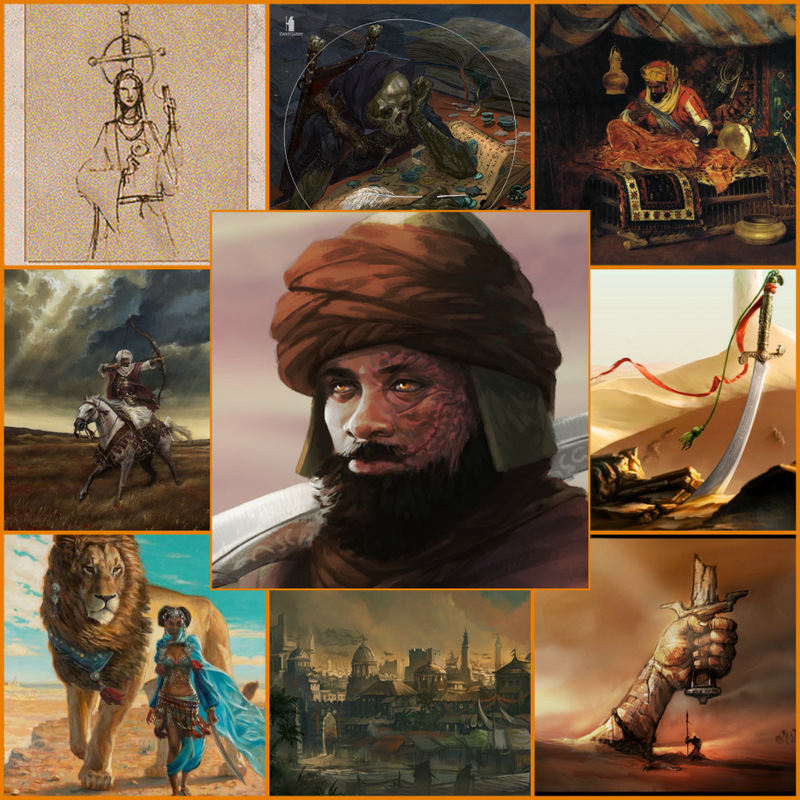 The Lion's Legend: "Amongst the tribes of Ra Kotu and the warbands I led, they know the truth that is obscured from many. I was the Lion, while not the sole ruler of the warband of united tribes; I was the commander of hundreds of noble warriors. We carved our path into the Sun Keep with blood and steel, I have learned to command through this campaign. Through that victory, even if the symbol had to die in the end, I tasted strength." Western Magic: "In the darkness of Akel's hunger, trapped in an unknowable ichor between what cannot be known...I emerged feeling a connection to my home that is hard to describe. I feel Tava's winds and walk easily through her sand. The desert calls to me and I embrace her. It is crude, unpracticed, and unrefined; but sometimes a holy wind shall guide my arrow. Sometimes a storm shall hide my approach. I once said that I would become an unending storm to wash the Alik'r clean, I did not know my conviction was so...literal." Champion of the Ra Gada Olympiad: "Countless hours, days training for the Olympiad. I bled, fought, and journeyed across the Alik'r to prepare myself for those fights. Foreign fighters came, but only a child of Yokuda would claim victory that day. I take some pride in how far I came and what I learned, not the victory itself." Tobacco Pipe and Coffee Beans: "The smoke helps me unwind after long rides and the beans keep me going on them." Sahm: "It took many months and the gentle guidance of a caring hand, but I have found a deep bond with this lion. My friend and partner in the field, we know each other better than most know themselves. While I still ride a horse into the desert, there is no hunting partner I'd rather have at my side." Arms: "I am not a walking fortress, but perhaps I try to emulate an arsenal. My saber and khopesh, maybe a few canisters of flutefire? I have stormed walls, faced demons, and stared into the abyss with these weapons by my side. I would walk to the Far Shore and back with them need be." Ebony Khopesh: "I wear it openly on my hip, it is a symbol of my status as Huntmaster and one of the most important tools I have in carrying out my duties. A silver edge to deal with the unholy and an enchantment to silence their connection to magicks. In times of Inquisition, I have used it too in subduing those that resist. Despite its nature, it is a symbol of my people. Even if its existence is a crime in itself, its use in for the greater good brings me some peace. It is a tool of many contradictions and conflicting ideals, it is a weapon fit for me; no?" Wolfsbane Incense: "A gift of trust from the Chatelaine, the rare herb known as 'Wolfsbane' from the province of Skyrim. Perhaps the only thing that can level the playing field between horrid were-abominations and the righteous." Birthplace: Leki's Blade- "My mother frequented a whore set up outside the town whenever the tribe would come pay tribute to the town's masters. Eventually, her escapades created me and she took my father as her own 'slave'...I never really thought of it as slavery, was just an arrangement that prevented my father from having to undergo the right of initiation...my father was many things, but I do not think he would've survived out in the desert nor brought back proof of a successful hunt." The Tribe: "Not as large as some, not as small as others. Familes living together and doing what they can to survive and continue our traditions. Perhaps you wish to learn them sometime? I can teach you our methods but they are not for the weak. Strong character and personal balance are needed to survive our ways." Venturing Outwards: "There comes a point where every warrior of Leki is presented an option: defend your family at home or do Leki's will aborad. I decided on the latter, regardless of if I can change the world I can do right by my people from afar. There are old tomes and texts I see, ancient powers so holy lost in the sand. If I can revive them, I can wield them: strength and power shall protect the Redguard once more." The Fourth Hand: "In my journey across the Alik'r, I came into the service of the Marquess At-Rabiah. She granted me honors and respect that few did, and though her vision of the future of Hammerfell was through Forebearer eyes I could not deny the beauty of the vision. For the greater good, I leant myself to the House. I pledged service and entered into their hunters, the Fourth Hand. Whatever lurked in the shadows and that was unclean was met with my blade." The War of the Lions: "Perhaps I think too much of the war? How can I not? I rode into each battle on every front. I led men into breaches and to their deaths, all in the name of the Marquess At-Rabiah for the sake of the Alik'r and Ra Kotu. I saw unspeakable horrors summoned by a desperate enemy as brother fought against brother across the madness that few are willing to see. It was here though I solidified by service to the House and to the Alik'r, no matter how terrible it truly was." Friends: "I stand amongst a family now, a sworn member of the House. I cannot call them just 'associates' now, many are my friends. Arjana, my lover from the tribes, my Lioness behind closed doors. Brogden, a force of logic to the madness. The Marquess herself, a caring mother whom we all pledge ourselves too. Ibn, Azrin, and Zaibh, my brothers and sisters within the Fourth Hand and House. The Chantelaine, a scholar and so much more. Kragdin and Mor'id, my dear friends who i would walk to the Far Shores with to do anything for. There are many others now, too many to name. Leki bless me, I walked with a tribe now." Quirks, Habits, Oddities: "I chew on coffee beans quite frequently, they're really quite good. It is quite the pleasure when someone gifts me with those chocolate covered ones: they are my favorite." Hobbies: "It's quite relaxing making coffee, wouldn't you say? Or reading a good novel? A pleasant break from...and often ever-changing world." Group Affiliations- Children of Leki: "My tribe is an old off-shoot of the Ash'Abah, perhaps to some scholars we're still considered part of it. There are numerous factions, families, and clans within any organization as important as the Ash'Abah. The Children of Leki hold most of the same beliefs save for our reverence of the Goddess Leki." Group Affiliations- The Fourth Hand: "The Fourth Hand is a division within House Rousseau devoted entirely to hunting and the removal of dangerous elements from Ra Kotu and the Alik'r. Striking down unholy creatures and criminals too dangerous for even the darkest shadows, we reach out where others cannot. Be it deep within the Alik'r or the savannah of Western Hammerfell; no one can escape us once we have your trail." The War of the Lions: "I was on the front, grabbing my enemy by the belt. The Generals had their strategies and opinions. I had mine. There were hundreds of different semantics and nuances that I was willing to debate over, to pour myself into...mainly because if I'm going to that field of battle: I damn well want to win it. My faith seemed to be well placed once we breached the walls of the Sun Keep, so much of the war still must be spoken of." 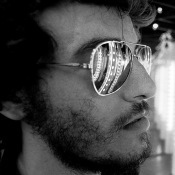 Scars: "...I attempt to hide them for the sake of modesty. The story behind them is...well...we all have our own scars from that night. Mine are just a bit more obvious than most." I like the personality points. 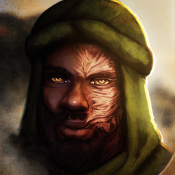 This is one of my favorite Redguard characters right here. Edited for Recent Changes and Events! What an absolutely gorgeous profile. Well done! Edited for recent changes, events, and gradual growth!